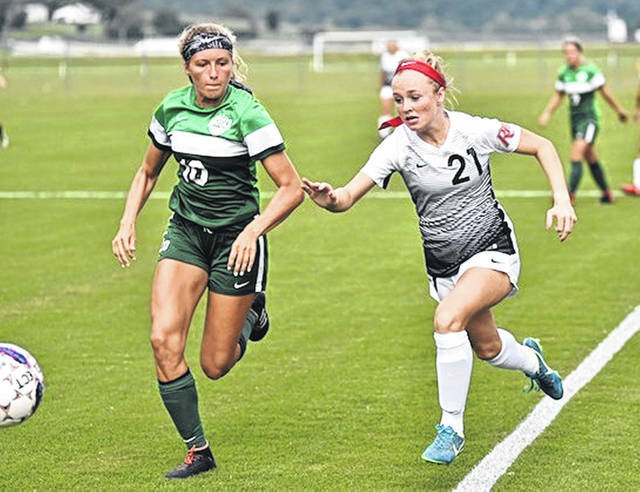 Rio Grande’s Payten Davis races Mount Vernon Nazarene University’s Adison Preston to the ball during the first half of Saturday night’s non-conference women’s soccer game at Evan E. Davis Field. The Cougars spotted the RedStorm an early lead before rallying for a 3-1 victory. RIO GRANDE, Ohio – Melanie Critzer sandwiched a go-ahead goal between a pair of scores by teammate Amberly Knox, leading Mount Vernon Nazarene University to a 3-1 win over the University of Rio Grande, Saturday night, in non-conference women’s soccer action at Evan E. Davis Field. The contest was the season opener for both squads. The Cougars ran their all-time record against Rio to 10-1, with the only loss coming by forfeit after the 2013 campaign when it was discovered that an ineligible player had been used in an on-field triumph over the RedStorm. Saturday night’s renewal of the series actually saw Rio Grande take a 1-0 lead just 3:39 into the match when senior Kelsey Lee (West Chester, OH) tapped a left wing free kick off the foot of junior teammate Brooklyn Pritt (Scott Depot, WV) past MVNU goalkeeper Anna Chrysler and into the back of the net. The lead lasted for a little more than 31 minutes before Knox fired a shot from the right wing which just cleared the outstretched arm of Rio senior net-minder Andrea Vera (Quito, Ecuador) for the tying marker. Critzer put the Cougars ahead to stay just 3:24 into the second half with a goal from just outside the upper left corner of the 18-yard box and Knox closed the scoring just over seven minutes later with a goal off an assist by Abby Creech. MVNU controlled the match after Rio Grande’s early score and outshot the RedStorm, 26-6, including a 14-4 edge in shots on goal. Chrysler finished with three saves in the win for the Cougars. Vera stopped 11 shots in a losing cause for Rio Grande. The RedStorm returns to action next Saturday, traveling to Milligan (Tenn.) College for a 2 p.m. kickoff.